Nashville, TN -- Producers of the acclaimed PBS music concert event Bluegrass Underground today announced the series is proud recipient of four coveted Emmy awards from the 28th Annual Mid South Emmy Awards. The awards were announced by the National Academy for the Television Arts & Sciences January 26th at Nashville's Schermerhorn Symphony Center. The Bluegrass Underground Emmys were awarded for Best Entertainment Program, Best Director-Program, Best Audio, and Best Lighting. The series, taped 1,000-ft deep with the Cumberland Caverns near McMinnville, TN were also nominated for Emmys for Best Photography and Technical Achievement. "The Bluegrass Underground Emmysreflects the commitment to quality and excellence that this series strives to achieve," said Todd Jarrell, one of the series' producers. "We are deeply honored for this recognition from our peers in television and very satisfied to see the work of our entire team recognized." According to series creator/producer Todd Mayo the series is a true 'musical adventure' created to shine a light-literally and metaphorically-on America's finest export: the diversity and quality of it's musical culture and natural beauty. 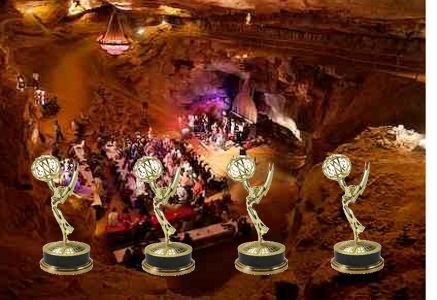 "These Emmy's go out to the entire crew, the patrons and viewers of the series, WCTE and PBS, our wonderful family of underwriters and all of the great folks at Cumberland Caverns" said Mayo. The Americana-Roots-Bluegrass series has garnered wide acclaim with past Emmy, CINE, and TELLY Awards, and is now airing coast-to-coast on PBS. A unique mix of HD video, near-perfect acoustics, and top musical talent brings viewers "an eye-popping presentation of one of the most visually amazing venues there is," says Jarrell.Currently midway through its Season Three run, Bluegrass Underground is set to tape its fourth season in the Cumberland Caverns in March 2014. Presented by WCTE (PBS) of Cookeville, TN, the series' underwriters include Nissan of North America, the Tennessee Department of Tourist Development, Griffin Technology, Colonel Littleton, and The City of McMinnville. Additional radio and monthly event sponsors include Ascend Federal Credit Union, French's Shoes and Boots and Fall Creek Falls, a Tennessee State Park. "Our partners believe in this series and these artists, and for their continuing support we are truly grateful," says producer Todd Mayo adding, "receiving these awards just adds icing to a very special cake." Please visit www.bluegrassunderground.com for upcoming performances and more information.